Have you guys seen the China Glaze Ombre sets at Sally Beauty? I recently stopped in and picked one up. Each Ombre set includes four coordinated polish colors from older collections as well as ten sponges, and they cost ~$13. Not a bad deal at all, especially if you don't own the polishes in the set already and you happen to have a $5 Sally coupon (like I did!). There are three available sets: Grape Expectations (purple), Sweet Sensations (pink), and Wait Teal You See (teal/green). Clearly I picked up Grape Expectations, which includes Sweet Hook, Spontaneous, Grape Pop, and Crimson. I tried the set's sponges on my right hand but found them to be a bit too coarse for my liking. I opted to use a triangle makeup wedge, like I always do for my gradients, on my photo hand. I will say though that the set's sponges were easier to use than the makeup wedge. They required less coats and were definitely more beginner friendly. The gradient just wasn't as smooth -- it was kind of like the sponge stamped its pattern on to the nail. Does that make sense? That's such a fntastic idea - and I love the result! Beautiful, I really want the Sweet Sensations ombre set!! Definitely a GREAT deal for four full size bottles. You did a beautiful job on the gradient as usual. Just beautiful! awesome! i have a $5 coupon too maybe ill go get this! The name of this set really caught my eye but those colours are amazing! Gorgeous, I love it! Lovely colours! These colours worked perfectly for a gradient! I have the teal kit, but I have not tried it yet. I wish I had the other 2 kits, but that was the only one left when I went. The purple and blue ones were great for this, the pink lightest colour takes three coats to get opaque, so it's frustrating. This looks great! I really love the colours in this set. 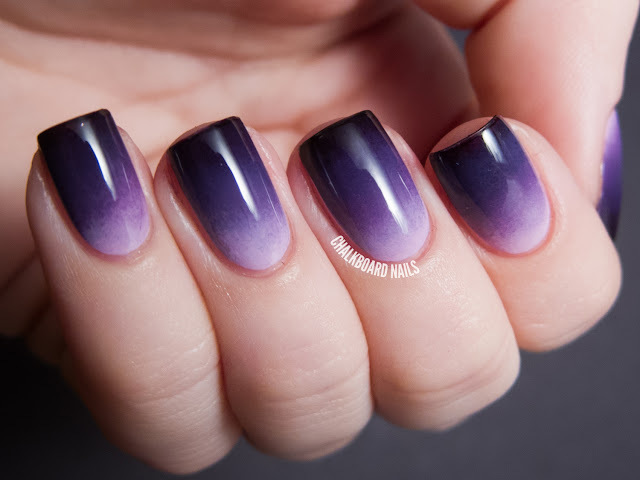 Gorgeous ombre gradient, love the purple! Only $13 for all that? Well, I know where I am going today. ahhhh I just decided not to buy anything for the rest of the month and you just got me wanting to run to Sally's ASAP! Could we see what it looks like with the sponge? This is a very nice and smooth gradient! Fabulous! The original sponge was used in the first picture, right? Nope, they are all photos of the same manicure. Gorgeous! I know what you mean about the sponge leaving it's image on the nail. I haven't managed a gradient I'm happy with because I can't find a sponge that does what I want it to! That's the same set I chose a while back but, mine didn't come with any sponges... QUESTION: do you apply the light color over the entire nail, wait for it to dry completely &, then sponge on the rest?? Yes that's how I apply it! Hi! Gorgeous! I bought the same kit and tried it and let's just say there's a very wide margin of quality between your sophisticated application and mine which looks like I got into my mother's nail polish behind her back (I'm 51 y.o.). Two questions, if you don't mind: 1) I also put the light color on the nail and wait for it to dry completely, but I also use the light color as the top stripe on my makeup sponge. Do you use just the remaining three colors as the stripes on your sponge and start patting on the sponge a little ways down from your cuticle? 2) Do you moisten your makeup sponge before painting the polish stripes on it in order to keep the polish from being sucked into the sponge? I would REALLY appreciate the help answering these questions would give me. Many thanks! 1) I do apply all four colors to the sponge. I just like to get down the base first. You need the base color on your sponge though to get a nice blending between it and the next lightest color. If you didn't put it on the sponge, the second color would just end up kind of stamping itself over the base, instead of mixing in to it. Does that make sense? 2) I don't moisten the sponge but I know of others that do. I usually just end up painting over the stripes on my sponge a few times until it seems decently saturated. You will probably have to repaint the stripes every two or three nails to be sure there is enough polish on the sponge. Thank you! I really love this technique and and am determined to really learn it. After I received your response, I realized I had two more questions (if you don't mind your thoughts being pried into once more). 1) What is your method for using the makeup sponge? After painting the stripes, do you press the sponge directly down once onto the nail to establish the general color areas and then begin patting the sponge gently up and down? Or do you start directly patting? and 2)(and, yes, I know this question will show I have OCD) how long do you pat each nail? I end up getting the sponge too dry and then it texturizes the tip of the nail which doesn't allow the top coat to smooth it out. 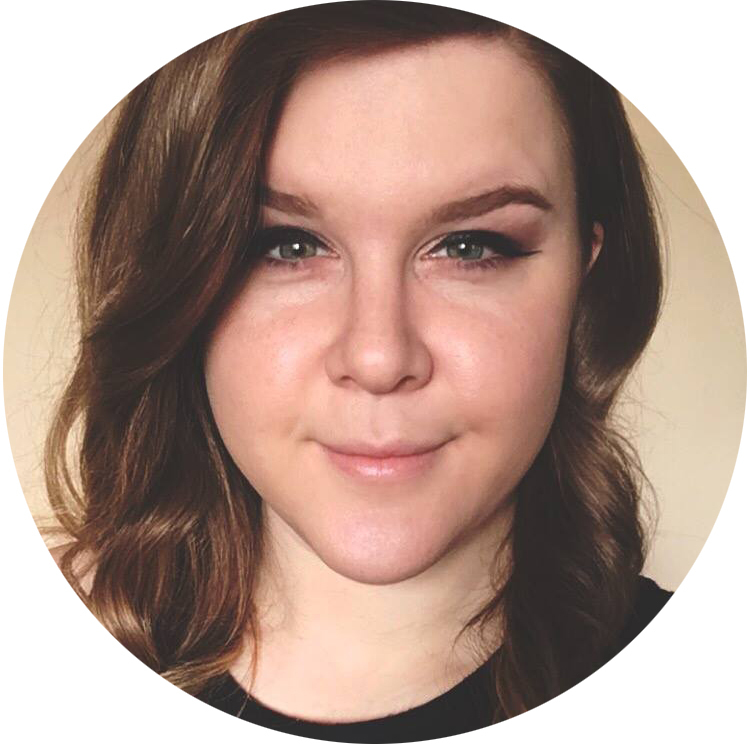 I know there are tons of tutorials and tips online about how to accomplish ombrés, but your technique is the closest I've ever seen to mine so I thought your replies would make the most sense to me (your first response was terrific!). And then I realized you had purchased the same CG ombré set that I did and I thought, "Well, that's gotta be some kind of sign that she's the one who can answer your ombré answers." I'd appreciate it if you responded again and then I promise to never darken your (ombré) doorway again. Thanks, again! 1) Good question... I think I do the one where I pat it down once to get the general areas down and then bounce after that. I don't think either way will make much of a difference though, whether or not you do the first "establishing pat" shouldn't change how you do the following pats. 2) I usually do each nail for maybe, hm, five seconds? The technique really takes patience. I usually work one hand at a time, gradually building up the layers. So I will pat for a little bit on one nail, move on to the next, and repeat for the rest of that hand. Then I will go back and start the process over again on the same hand. I repeat usually four or five rounds for a good gradient, I think? Hope this helps! Maybe I will try to do a video tutorial soon so you guys can see it directly. That is a perfect gradient you've made!